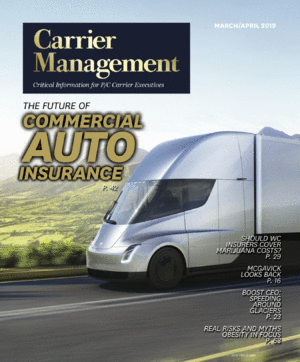 This article is part of Carrier Management’s Cultural Q&A series featured in the Nov/Dec 2018 print edition. Q: There is a famous saying, “Culture eats strategy for breakfast.” Do you agree? Do you spend more time on culture or strategy? How does your culture support your strategy and vice versa? Tim Attia, CEO and Co-Founder, Slice Labs Inc.
Slice Labs is an InsurTech company that provides an on-demand, pay-per-use insurance platform for the on-demand economy. In 2016, Slice set out to reimagine insurance through design, data and technology, delivering instant protection in affordable, bite-size chunks when customers need it, with no hidden costs. “Our goal was to build a digital insurer from the cloud down that would perform orders of magnitude better than traditional insurers,” CEO Tim Attia wrote in a Feb. 25 blog item explaining the launch of Slice’s Insurance Cloud Services (ICS), a cloud-hosted, end-to-end, digital-first platform that now allows traditional carriers to quickly make the leap to being a digital insurer at a radically lower expense. Attia and Slice co-Founder Ernie Hursh both previously worked at Bolt Solutions, a successful digital distribution platform for P/C insurers. Slice officially went live with sales of on-demand insurance policies to homeshare hosts in more than a dozen states in May 2017, with a unit of Munich Re providing the coverage. Following the success of the on-demand insurance product geared directly toward gig entrepreneurs, Slice announced in January 2018 that it would enable insurers with legacy technology infrastructure to offer on-demand insurance to existing customers by leveraging the Slice ICS platform. The Slice ICS platform is powered by machine learning and advanced big data technologies along with Ph.D. behavioral science expertise. More recently, Slice announced XL Catlin (now AXA XL), Legal & General and The Co-operators Group are all ICS customers developing on-demand insurance offerings. XL is creating an on-demand cyber insurance solution for U.S. small and medium-sized business; The Co-operators went live with a homeshare product in mid-September. Tim Attia, CEO and Co-Founder, Slice Labs Inc.: I think there’s a culture that inherently comes with startups in terms of attracting people who are excited by the possibility, by the challenge and by the unknown. But furthermore, we’ve spent a lot of time on culture, both subconsciously and deliberately. We’ve tried to hire people who we felt would fit into our culture and support our strategy. We give feedback on the positive and negative behaviors so that we can groom the culture that is right for us. So yes, our culture very much supports our strategy. Without the right culture, I don’t think we could achieve our intended strategy. The challenge, of course, is maintaining your culture as the company scales. Q: How would you describe your company’s culture today? Has the culture changed since the early startup days? If so, what prompted the change? Attia: Our culture was being defined in the early days. In the three years as a business, our culture has become stronger and much more a part of our brand, our products and even more so a part of our strategy. There is a depth that has been developed, and we recognize that not only are we developing on-demand insurance products and partnering with carriers but that we are building a company. We are collaborative at heart; we welcome different ideas, points of view, theories, methods and voices. It makes us stronger and smarter. It awakens us to the talent and brilliance around us. It challenges us to consider things we hadn’t thought of. Without our culture, we would not be the company we are. Q: How does the structure of your organization support the current culture? Attia: Our structure is fairly flat, meaning we try to spread ownership and responsibility. Our goal is to keep everyone engaged and contributing. There are not a lot of layers or hierarchies—and we intentionally left titles off our business cards. Anyone can talk to anyone. We like to keep it casual and fun. We do so in an open office space where we share ideas with open minds and ears. We don’t have many rules, just be kind and give us your best. We have a few offices around the globe—in New York, Cleveland, Ottawa and London. And we have many employees who work remotely. We are also distributed out of the box. The other two co-founders and I, and our early executives, were all in different cities. This helped to promote a distributed decision-making culture where we don’t have the hierarchies associated with traditional businesses. It also helped us to be scalable out of the box since we needed to be able to operate without being face-to-face from Day 1. Culture becomes the guide in this situation. Q: Describe your role in shaping and perpetuating the culture. Attia: Culture oozes out of the walls (well the virtual walls) at Slice. Culture is perpetuated in how we speak to each other, think and make decisions. It guides how we hire people, but most importantly, it guides our direction and where we are going collectively. It is interesting that some new tools like Slack provide a great platform for supporting culture as the company grows, but the biggest part for us, as we are distributed, is that our culture makes its way into the people we bring on, the products we build, the way we interact with customers and the brand we portray to the market, our employees, family, friends, etc. Brand is a key way we communicate culture. Q: Does the company have a chief culture officer, or are you considering adding that role to the C-suite? What other leaders help to shape the culture of your company, and how? Attia: I think if the culture is strong enough it will ooze out of the virtual walls. I think aligning culture with the strategy of the company allows for the results we achieve together to be the chief culture officer. If we are successful in getting where we planned to go, and get there the way we wanted to, then the culture will be apparent. Our customers will also be an extension of that culture. InsurTech vs. Incumbents: What’s Really Different About Their Cultures?